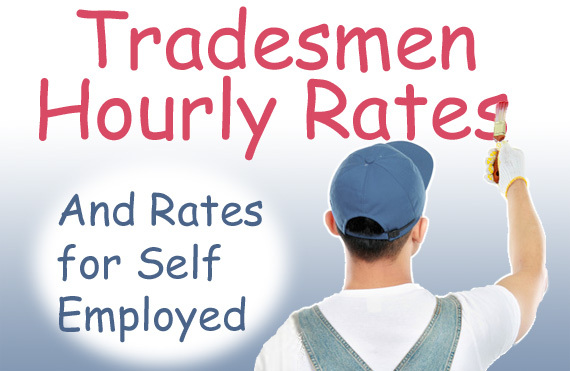 today I want to talk about hourly rates for tradesmen and construction workers in Ireland. This article may be of interest to both customers and tradesmen. Our users often ask us what is a fair hourly rate to be paying tradesmen as some of the rates quoted seem at first glance to be very high. I did some research and I came across the Registered Employment Agreement that was agreed between the Construction Industry Federation and a number of the unions. In that case a self employed tradesman would be charging 17.21 x 2.5 = €43 per hour but the charge would be higher per hour if it was less than a days work as you would have to account for . If the tradesman is registered for VAT, it would work out at €43 + 13.5% = €48.80 per hour. Some tradesmen (the same as any other profession) can command a premium if they are highly specialised or carry out a higher standard of work than would be the norm. So as you can see when tradesmen charge prices like these they are not so high afterall. If you are a customer keep in mind that it is better to get a price for the job rather than a price per hour so at least you’ll know how much exactly it is going to cost and you can compare prices more accurately. If you must pay by the hour be sure to set out any limitations you have in terms of funds available and time expected. Be sure also to consult with the tradesman and to review the work daily. The time taken should not be open ended. Bare in mind that some tradesmen will not work for an hourly rate and will prefer to work for a price. I hope this helps some of you who were wondering about hourly rates for tradesmen, whether you are a customer or a tradesman. If you have any questions or comments please feel free to leave them in the comments section below. Building Materials – Who should buy them, Customer or Tradesman? Will Stricter Building Regulations Improve Building Standards in Ireland? Construction Contracts, why are they needed? This entry was posted in Price Comparisons. Bookmark the permalink. Just for the record, all Registered Employment Agreements (REAs) were declared unconstitutional and ceased to have statutory effect in 2013. These rates are unenforceable for anyone employed after that so in reality the reference to rates and the multiplier used here is pretty redundant. Is €400 a day or thereabouts a reasonable rate? I think it very much depends on the job being done and the quality of the tradesman. thanks for your reply, it just goes to show that it is a complex subject. I suppose the important thing for tradesmen is to realise is that charging €20 per hour as a self employed person could end up providing them with a smaller income than if they had a full time job with a basic wage. Having said that there may not always be any choice if the alternative is unemployment without employment benefit. Thankfully we are seeing an upturn at present in the building industry which hopefully will provide a decent income for tradesmen while at the same time providing good value for the consumer as well. This comment is awaiting moderator approval. You’re receiving this message because you’re signed up to receive notifications about activity on threads authored by tradesmen1. You can unsubscribe from emails about activity on threads authored by tradesmen1 by replying to this email with “unsubscribe” or reduce the rate with which these emails are sent by adjusting your notification settings . sharing this information with us. as that was my understanding of it back then. have known the full details or extent of the project. Hi guys, I recently have gone out self employed painter and decorator Im curently doing work for a property developer and a builder. Im not registered for vat. They pay for paint and materials and my fuel cost. I charger €175 a day labour is this low or the norm?? How do i figure out what i can charge a builder from a regular person that wants their house painted? I figure i should be charging the builder alot more than i am?